It’s all about fresh flavor from fresh ingredients. Their mission is to provide delicious all natural products that are easy to prepare as part of a healthy lifestyle - live life with flavor. Executive chef, Susanna Tolini revels in introducing customers to a whole new way to enjoy chicken sausage- from scrumptious unexpected flavors such as Roasted Pepper & Asiago and Spinach & Feta to great, easy recipe ideas for all of our 14 al fresco gourmet flavors. I was sent the Sweet Apple with Pure Vermont Maple Syrup, Sweet Italian with fresh red and green peppers and the Spinach and Feta with well, spinach and feta. I made the Sweet Apple Sausage with pancakes for dinner one night and it paired perfectly. The Sweet Italian Sausage I made with ground beef, chick peas and sauce. and poured over pasta. DELICIOUS!! Spinach and Feta Sausage was so yummy. I'm not a fan of feta cheese but this was my fav. I paired it with sauce and pasta as well. I'm not a huge sausage fan but I have to admit this is really good. The kids enjoyed it as well. 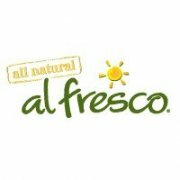 al fresco is now the #1 chicken sausage brand in the U.S. We offer our all natural chicken sausage in dinner and breakfast varieties. All of our products have 70% less fat than pork sausage and are free of nitrites, nitrates, preservatives and artificial ingredients, but full of flavor. way too much garlic and onion and salt in the spinach/feta. Made our whole house stink for days afterward. Not to mention heartburn and belching. YUCK.